In light of recent findings about Moon Jellies I thought I’d do something a little more in depth (pardon the pun) about these unique animals. Our Northwest shores are blessed with an abundance of invertebrate life. Sea Stars (starfish) are our most famous and favored non-backboned representative, but when it comes to lacking backbone nothing does it better than a jellyfish. 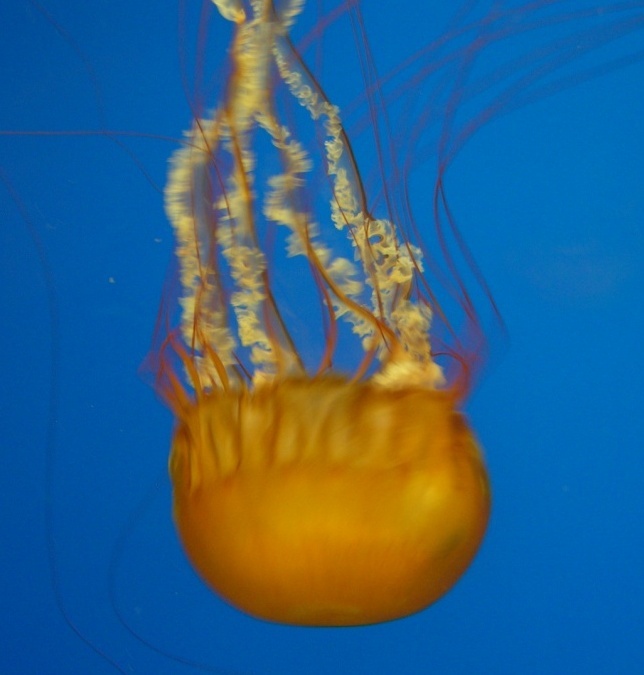 Jellyfish are classified under the phylum Cnidaria, (pronounce the word without the C) a huge group of 10,000 or so animals that also contain the hydras (class Hydroza), sea anemones, and corals (class Anthoza). For the most part Cnidarians are marked by two distinct characteristics: radial symmetry and a relatively large internal space for digestion. Generally speaking, if you cut a cnidarian in half you get a pair of mirror images with a large space in the middle for digestion of food, tentacles on either side, and a mouth in the middle. True jellyfish are in the class Scyphoza, but many Hydroza are so similar to jellies they are commonly referred to as jellyfish. Generally speaking jellyfish are distinguished by a mobile lifestyle and more fully developed tentacles. The other guys in this phylum prefer a settled existence anchored to the marine substratum. With the exception of certain hydras all are lovers of the marine environment. Like sea stars we have plenty of jellyfish and most have varying common names so sources vary. To avoid confusion the following list only includes those animals most people would instantly recognize as a jellyfish. Sizes refer to the measurement of the animal across its medusa, the bowl shape body common to most jellies. Class Hydroza. At 1 – 2 inches one of our smallest jellyfish is this little guy. Although quite common its small size probably allows it to escape notice as it clings to the sea weeds it prefers. Class Hydroza. 3-4 inches. This jelly has a triangular like sail filled with gas filled pockets. This “float” protrudes above the water and ensures travel wherever the wind blows. Also called By the Wind Sailor. Class Hydroza. Often found stranded on the beach these little guys run about four inches across their medusa and are noted for a luminescent glow at night. Also called a Many-ribbed Hrdomedusa. Class Hydroza. 2 inches; also called the Red-Eye Medusa. 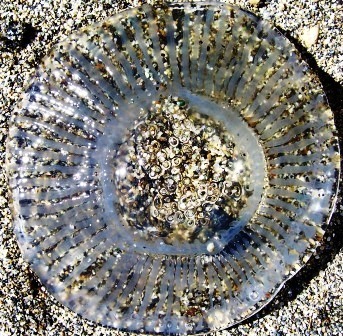 The Penecillate Jellyfish has a distinct bell shaped medusa. Despite its relatively small size this is considered the largest hydro medusa on the west coast. Class Scyphozoa. 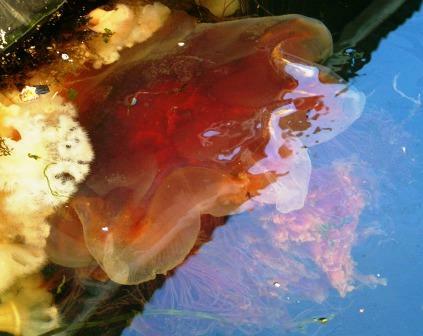 2 feet or more in diameter in our area; much larger in other parts of the world, the Sea Blubber is our largest jelly. Class Scyphozoa. 2 feet or more in diameter. 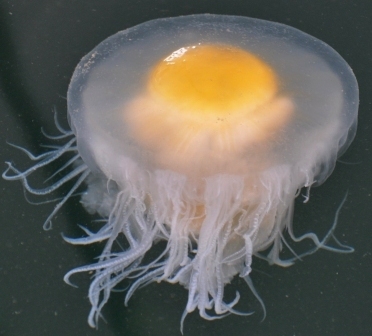 Also called the Fried Egg Jelly fish this aptly named cnidarian is curiously missing from many sources dealing with jellies in the Northwest, although it is a common species. Eats other jellies. Class Scyphozoa. 8 – 16 inches; Moon Jellies are likely our most common jelly, although the big Sea Blubber may give them run for that title as well. 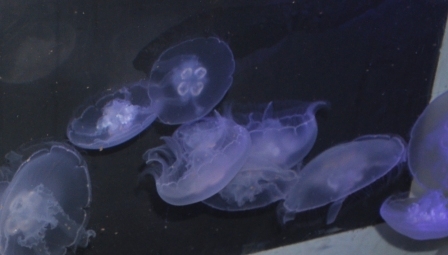 Often the type of jellyfish featured in aquariums. Outside of snakes no other animal seems to fascinate and repulse as much as the jellyfish. Their completely alien physiology, infamous sting, and bizarre lifestyle are enormously intriguing. Even washed up on the beach jellies are an instant attraction. People point, stare, and comment. But touch one? No, no, no! Live specimens display that mindless, umbrella like, seemingly futile flopping to move about. In fact the things have no mind at all. Yes, jellyfish are about as inhuman as you can get. Here is an animal more than 95% water, without limbs, brains, a nervous system, or blood, and almost totally at the mercy of weather, wind and ocean currents. Yet despite these limitations they have a worldwide range and enormous populations. Jellyfish are generally lovely and graceful creatures. 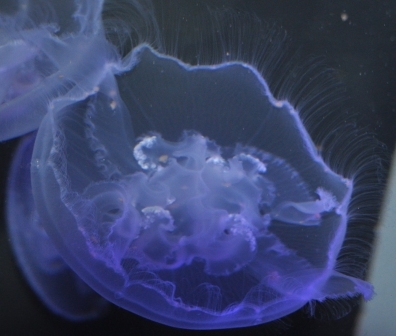 They are a standard feature of public aquariums, especially the beautifully translucent Moon Jelly. Have you ever been to one that did not feature a porthole type aquarium with Moon Jellies illuminated by bluish lunar light? They bob and float like innocent wraiths; an endless, rhythmic ballet of rise and fall. It is simply fascinating to observe. But then there are those pesky stingers; some of which contain the most virulent poisons in the natural world and are the cause of far more human deaths than sharks. Fortunately these particularly dangerous species do not inhabit our Northwest waters. Anemones and hydras have stinging tentacles but when it comes to length and effectiveness nothing comes close to the jellies. Our own Sea Blubber, also called Lion’s Mane, is the largest jellyfish in world. Most specimens here in the Northwest reach about two feet across the dome or medusa with tentacles reaching thirty feet. Pretty impressive. But in arctic regions they are reported to reach widths of eight feet with sixty foot long tentacles. The sting from these guys packs a wallop and not just burning or blistering. Exposure to the tentacles for an extended period can result in muscle cramps and breathing problems. The cause of this painful aspect of cnidarians is the nematocyst, a tiny organ that lines jellyfish tentacles by the thousands. The nematocyst operates by hydrostatic pressure and chemical reaction. Picture it this way. A fish – or your bare leg – comes into contact with the tentacle of a jellyfish. The slight pressure causes two spontaneous reactions. First, the nematocyst, previously folded inward, now unfolds outward with explosive power and drives a thread like tube armed with spines into the nearest object. That would be bad enough, of course, but remember that this tentacle is designed to kill prey for food. A couple of simple stings might not do the job. Enter step two. The same stimulus that fired the nematocysts causes the tentacle to wrap around the object thus increasing the number of these tiny organs firing. Get enough of these little spines and irritating biochemical into your system and you have a real problem. Pity the small fish that gets caught up in this cycle. In short order it will end up in the jellyfish digestive system. You, on the other hand may only end up in the hospital. Recent research about these supposedly simple creatures has revealed some surprising facts such as jellyfish “eyes” that react to light. Other mysteries like the sudden population explosions and contractions remain unexplained.